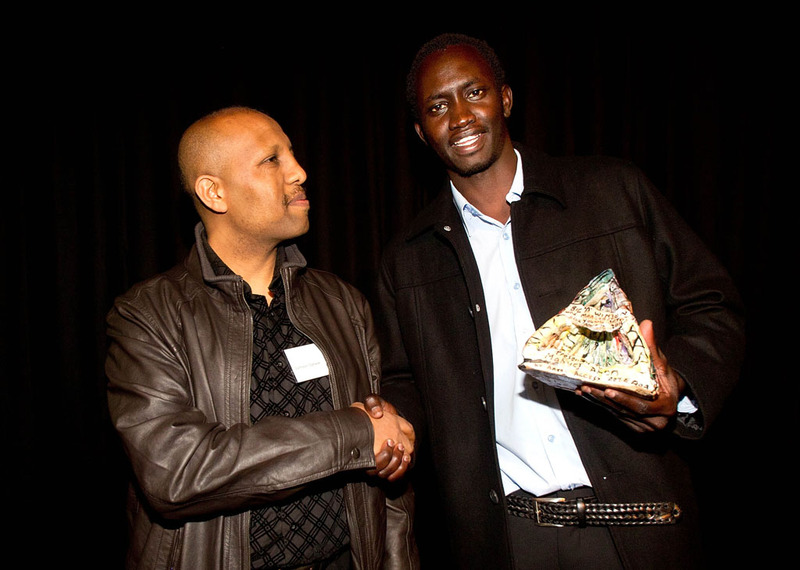 Makuei Aken, the recipient of Arts Access Aotearoa's Big 'A' Winton and Margaret Bear Young Artist Award 2011, is one of four writers taking part in a panel discussion on 14 November, organised by the Wellington branch of the New Zealand Society of Authors to recognise Courage Day. Entitled Write to Freedom: Refugee Writers in Wellington, the panel includes Makuei Aken (Southern Sudan); Samson Sahele (Ethiopia), Julia Tha (Burma) and Sonita Azizi (Afghanistan). The panel will be introduced by Wellington writer Fiona Kidman, who was involved in the first creative writing workshop and publication organised by Samson Sahele and the Wellington Refugees as Survivors Trust. Each writer will talk about their journey to New Zealand and explain what writing means to them. Makuei Aken, for instance, was born in the village of Aweng in Southern Sudan. At the age of nine, he was forced to flee the civil war ravaging his country. His family was scattered and he still does not know where some of them are. He spent five years at Kakuma, a refugee camp in north-western Kenya crammed with tens of thousands of displaced people. In 2003, aged 13, Makuei was accepted into New Zealand with his aunty and two young cousins. In 2010, Makuei, Julia Tha and Sonita Azizi were among the participants in Samson’s second creative writing workshop. Their work features in the resulting publication, Beyond the Dark Journey. In Addis Ababa, Samson was a journalist and newspaper editor. He fled his homeland in 1996 and finally arrived in Auckland in 2000 as a political refugee. Samson is a cross-cultural worker at Wellington Refugees as Survivors Trust and has run three creative workshops for young refugees. He also completed a degree in communications management last year at Massey University. He has just received a Creative Communities Scheme grant to publish a collection of his poetry and is also working on a book in his first language, Amharic, the official language of Ethiopia, about his experience as an Ethiopian in exile. Original generation time 1.4769 seconds. Cache Loaded in: 0.0005 seconds.